Carte des Carolines Meridionale et Septentrionale, La Georgie, La Floride, Orientale et Occidentale, Le Pays des Cherokees, la Vaste Contree des Muscogulges, ou la Confederation des Creks et Pays des Chataws. A beautiful 1799 example of Jean Baptiste Poirson's map of the American Southeast. This map was engraved to illustrate the 1799 first French edition of the naturalist William Bertram's travel narrative describing his explorations in the American Southeast. Coverage extends from the Mississippi River to the Atlantic and from Lake Michigan to the Florida Keys. It extends no further east than the Delaware River. Cartographically, the topography and river systems are exceptionally well developed. Settlement is generally limited to lands to east of the Allegheny Mountains. Reflecting Bertram's travels, scores of Indian villages are located in the southwestern frontier (present-day Alabama and Mississippi) and Florida. Curiously the name 'Nouvel Etat de Kentucky' has been applied to the entire territory northwest of the Tennessee River (here R. de Cherokees), as far as Lake Michigan. William Bartram was an American Naturalist of Pennsylvania Quaker descent. John Bartram was appointed Royal Botanist for North America by King George III in 1765 and shortly thereafter toured the American Southeast. In 1773, he embarked upon a second historic exploration of the American Southeast, which led to the publication of his map, traveling through parts of Georgia, the Carolinas, and Florida. Along the way he recorded flora, fauna, and his interactions with First Nations peoples, particularly the Creek, Cherokee, and Choctaw. He collected some 200 botanical specimens and made countless sketches. Among his discoveries are a tree named after Benjamin Franklin (a friend), the Franklin Tree or Franklinia Alatamatha. The Franklin Tree population was decimated by cotton pathogens from the nearby plantations and is now extinct in the wild but survives in cultivation. 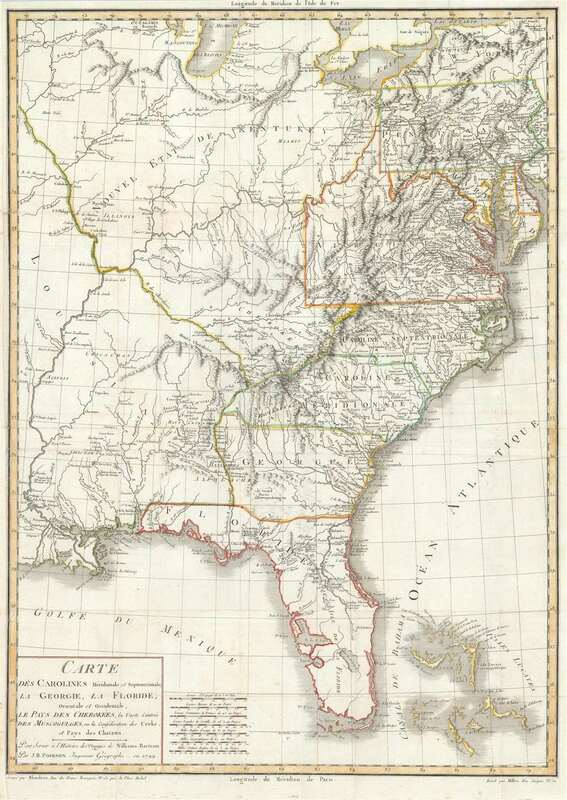 This map was first published in the 1799 French edition of Bertram's Travels through North and South Carolina, Georgia, East and West Florida. The 1791 English first edition did not contain a large map of the United States. It was republished in a revised 1800 edition, also in French. The map is held by a number of institutions, as are French editions of Bertram's work, but the separate map is rare to the market. Jean-Baptiste Poirson (March 6, 1761 – February 12, 1831) was a French engineer, globe-maker, geographer, and cartographer active in the late 18th and early 19th centuries. Poirson was born in Vrécourt (Vosages), France, the son of the town's master blacksmith, Pierre Poirson. Completing his studies in mathematics, Poirson took a position with the map publisher Edme Mentelle (1730 - 1815). From about 1790, maps begin appearing under the Poirson imprint. Having attained some recognition for correcting the work of earlier geographers, Porison was part of a team that collaborated on a large terrestrial globe for the instruction of the Dauphin. After 1803, he was again called on to produce an updated globe, this time for Napoleon Boneparte (this globe is preserved at Fontainebleau). Among his more significant works are the maps associated with the French edition of Alexander von Humboldt's Atlas Geographique Et Physique Du Royaume De La Nouvelle-Espagne. He also worked with Conrad Malte-Brun (1775 - 1826) and François-Raymond-Joseph de Pons (1751 - 1812). In 1825, Poirson and his wife settled in Valence-en-Brie (Seine-et-Marn), purchasing a house on the main street, today's Rue André-Taboulet. He died there in1831 and was survived by his son, the famous French playwright Charles-Gaspard Delestre-Poirson (1790 – 1859). Bertram, W., Illustrations de Voyage dans les parties sud de l'Amérique septentrionale…, (Paris: Carteret and Brosson, Dugour and Durand) 1799. Very good. Left margin extended. Some wear on original fold lines. Light foxing. OCLC 6344245. Phillips (America) pg. 872. Stevens Catalogue of Rare Books Relating to America 1617. Howes, W., U.S.iana (1650-1950): A Selective Bibliography in which are Described 11,620 Uncommon and Significant Books Relating to the Continental Portion of the United States, B223. Sabin, J., A Dictionary of Books Relating to America: from its Discovery to the Present Time, 3870. Streeter Sale 2:1088. Field 94.